Adelaide, South Australia, 8 March 2017 – Unlock the Past announces another innovative event – a Holy Land tour and associated genealogy conference (Israel). This is organised in partnership with the Israel Travel Centre. It is a general Holy Land tour timed around, and taking in, the 31 October centenary commemoration of the Charge of the ANZAC Light Horse on Beersheba on 31 October 1917. The general tour will visit many places of Christian/biblical interest, as well as later Christian and general history – Caesarea built by Herod the Great, the Sea of Galilee, Nazareth, Jerusalem (2 days and 2 nights), the Dead Sea, Masada (the last stronghold of the Jewish rebellion against the Romans) and Abrahams Well and Visitor Center, Beersheba ... and more. The battle of Beersheba was part of the wider British offensive collectively known as the third Battle of Gaza. … The final phase of this all-day battle was the famous mounted charge of the 4th Light Horse Brigade. Commencing at dusk, members of the brigade stormed through the Turkish defences and seized the strategic town of Beersheba. The capture of Beersheba enabled British Empire forces to break the Ottoman line near Gaza on 7 November and advance into Palestine – from the Australian War Memorial. This is separate from, but immediately follows the tour. Unlock the Past is organising this in association with Israeli based MyHeritage as conference sponsor and host. It will feature 12 main presentations on a variety of topics – British Isles, Europe, Jewish genealogy, DNA, War in Palestine and MyHeritage’s technologies for genealogy. 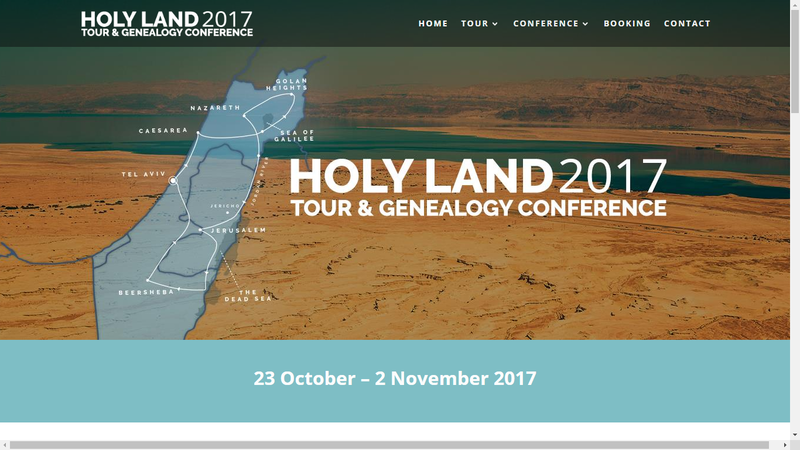 Presenters include Caroline Gurney (England), Daniel Horowitz (Israel) and Judy Russell (US) … and others yet to be announced. Follow developments and discussion - on the tour/conference Facebook page. Unlock the Past was established in 2009. It is the event and publishing division of Gould Genealogy & History which has served family and local historians since 1976. It is a collaborative venture involving an international team of expert speakers, writers, organisations and commercial partners to promote history and genealogy through innovative major events and a new publishing brand. It also maintains general and events directories online. MyHeritage – www.myheritage.com – is the fastest-growing destination for discovering, preserving and sharing family history. MyHeritage is available in 42 languages. Learn about content, technologies, and services at MyHeritage designed to help you discover new information about your family and to find previously unknown ancestors.